Classic New Zealand Sight Fishing for Big Wild Brown Trout! Escape tired lodge-type offerings. Go early / Stay late / Experience more success. Save time, money & frustration. Enjoy great access, flexibility and the best year-round fishing options available! Updated 16 September 2018. Start planning your NZ Adventure Now. Zane Mirfin, 51, is one of New Zealand’s most experienced fishing guides and heads Strike Adventure Fishing, with 33 years continuous year-round professional operation, since 1985. Zane Mirfin is a brand name in New Zealand Fly Fishing. Save time, money & frustration. Enjoy specialist and professional advice, great access, flexibility, with the best year-round fishing options available. Why fish with strike adventure? 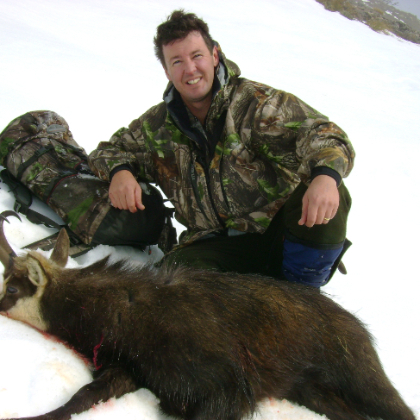 We understand that organising a fishing or hunting adventure down-under can be a daunting task. Strike Adventure is a proven safe pair of hands to assist you with your next big adventure and we can give you honest, expert, and objective advice on all facets relating to fishing, hunting, travel, and accommodation. Ask your questions today. Zane Mirfin, 51, has been guiding 33 years since 1985 and has been featured in books, videos, magazines, newspapers, and calendars. His extensive knowledge, experience, and outdoor ability will help you to become a better angler or hunter on all South Island locations. Zane is an enthusiastic and motivated guide, who is a patient teacher and fun companion who has your safety and success top of mind. Strike Adventure is fortunate to have a large percentage of return clients, who recommend us to their family and friends. We offer a large variety of experiences and activities over a unique geographic area so we always have a totally new adventure to show you or your friends. We understand that the real adventure of any outdoor experience for our clients is visiting fresh, new, and exciting places. In the eternal competition for finite resources, we know where the big fish swim and the trophy animals roam, so there's no need to play Russian Roulette on your next big adventure. Let us help you today. Information & Tips: Check out the ongoing success of our anglers & hunters. © 2008 Strike Adventure Ltd. All rights reserved.